On July 24, Solar Impulse took off from Cairo for the final leg on its round-the-world flight. 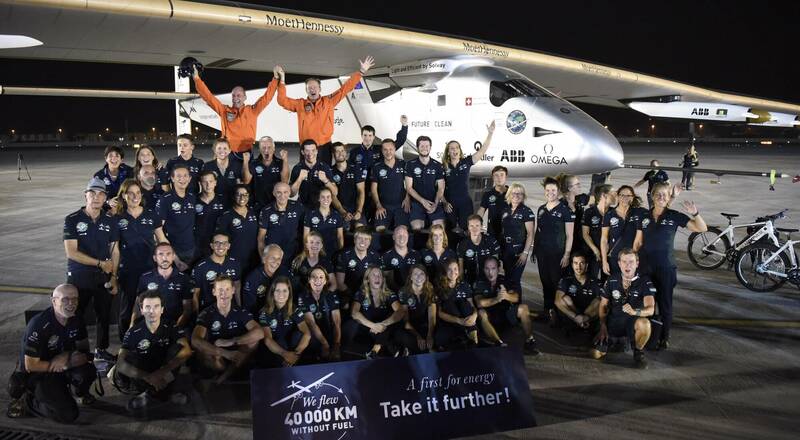 The first aircraft powered only by solar energy arrived last evening in Abu Dhabi, where it began this amazing adventure in March 2015. This groundbreaking initiative has been supported by Moët Hennessy and LVMH. Solar Impulse is a pioneering project led by two explorers, psychiatrist Bertrand Piccard, and engineer and entrepreneur André Borschberg. To promote clean technologies, they completed an amazing feat, flying around the world in a plane powered only by solar energy. This technological and human adventure required a dozen years of research and development before Solar Impulse lifted off on its first flight. The partnership which Moët Hennessy forged with Solar Impulse in 2015 enabled the LVMH Group to join the adventure in 2016 with a special mentoring program with the two pilots, Bertrand Piccard and André Borschberg. Six managers selected for the program have benefited from the pilots input and support in regular correspondence and phone conversations. Several of them met their mentors face-to-face during the stopovers in New York and Seville. LVMH salutes this amazing achievement, which demonstrates that alternatives do exist to reduce energy consumption and save natural resources. Bravo André, bravo Bertrand, and thank you Solar Impulse!